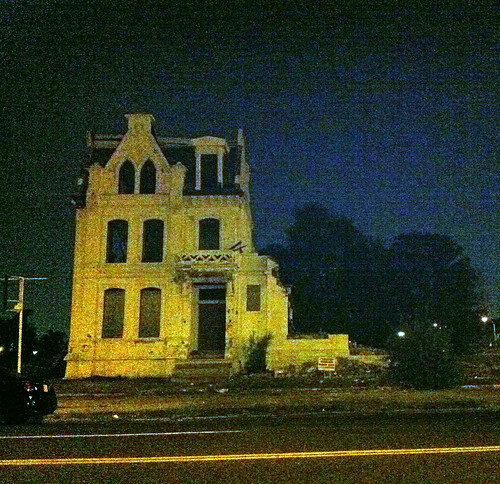 Last week I learned that what remains of the Winkelmann House at 1930 St. Louis Avenue is being demolished. According to the City's property database, a demolition permit was applied for on June 22nd. Demolition of the remains of the one story west wing, added when the home was converted to a funeral parlor, has mostly been completed, leaving only the beautiful circa 1873 stone facade of the original home standing. 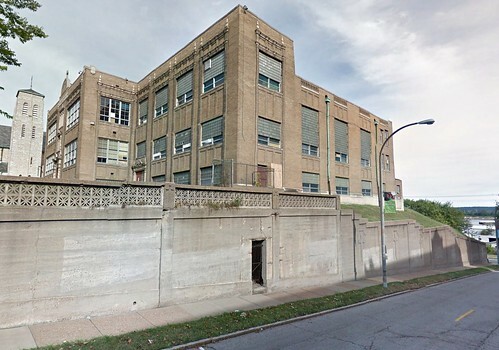 Michael Allen of the Preservation Research Office told me that Paul McKee, the buildings owner had given the St. Louis Building Arts Foundation two weeks to come up with a plan to salvage the facade, without chipping in any funding, of course! There have been discussions of producing measured drawings to market the facade for re-use. Below is a photo from January 2, 2007, just after the cancer of brick theft, which would consume most of the structure, had first attacked the funeral home rear garage addition. Coincidentally, one of Paul McKee's many shell companies had taken ownership in 2006. No attempts were made over the five years of slow degradation to secure the home or prevent further attack on the structure. After the stone facade is salvaged, crated and taken away, nothing will be left but a vacant plot of land and an asphalt lot. So much for Regeneration! 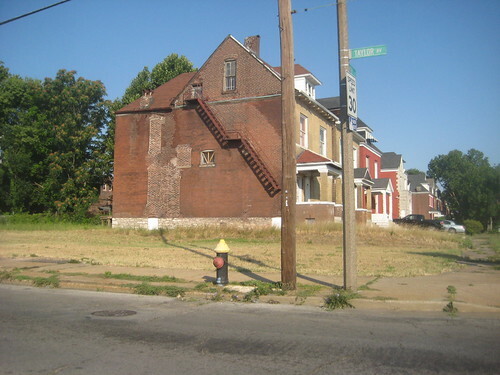 Last night around 3 am, the Grand Livery & Boarding Stable at 3441 Juniata, just east of Arkansas Avenue, was destroyed by fire. 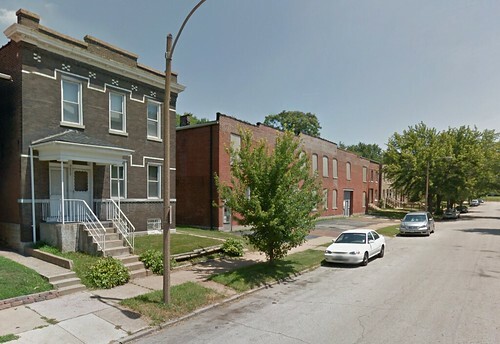 The Post-Dispatch reported that the three alarm blaze spread to an adjacent four family building, gutting one apartment, at least two garages an several nearby cars. By the time the fire was put out, there was nothing left but piles of rubble. 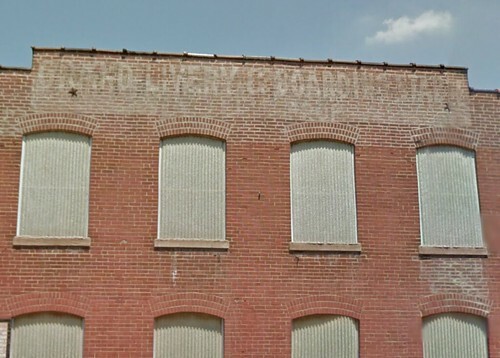 The faded painted sign from the building's early days was barely visible on the parapet. For a livery stable, the buildings construction date of 1908 was comparatively late considering that automobiles had become fairly commonplace by the 1920s. 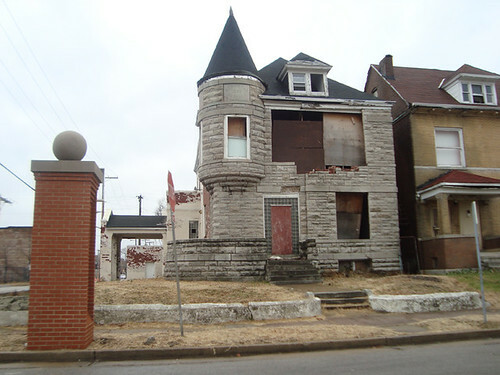 According to a 1903 Sanborn map, the block where the livery stable was located had not yet seen any building construction, nor had several other nearby blocks of this area of Tower Grove East. In recent years the building had been used as an auto repair shop. At one time livery stables were a fairly common sight in the City, although not many are left today. Jest a few years ago you might remember that SLU demolished a livery stable at 3401 Locust for an enlarged surface parking lot. The City's oldest livery stable was located at 310-314 Walnut and had been converted to a parking garage by the time it was demolished. There was even a livery stable at the corner of 9th & Pine Streets, where south half of the Paul Brown building is located. The Grand Livery & Boarding Stable was located on a block that is now all residential and had great potential for conversion to lofts, offices, or both. Now it will likely sit a vacant lot until there is demand for infill construction. 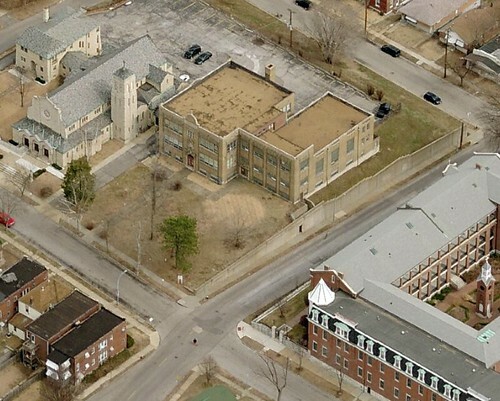 Next Monday, July 23rd, the Preservation Board will consider the proposed demolition of Saints Mary and Joseph School located at Holly Hills and Minnesota in Carondelet. 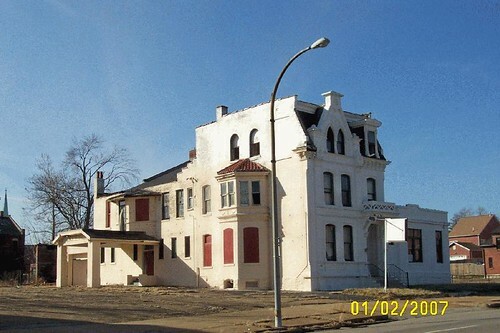 The building is located in the Central Carondelet National Register Historic District, which would make the building eligible for both Missouri and Federal Historic Rehabilitation Tax Credits. The Archdiocese must be chomping at the bit to proceed with demolition, since window removal was already well underway a few weeks ago (the windows were not original). Photo above by Angelo Olegna. 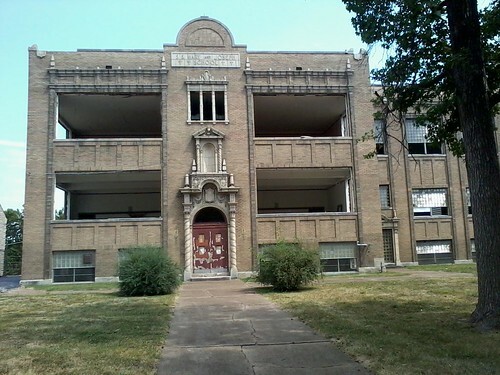 The building is located just across the street from the historic Sisters of St. Joseph complex. As far as I know there is no proposal for any new structure on the site. 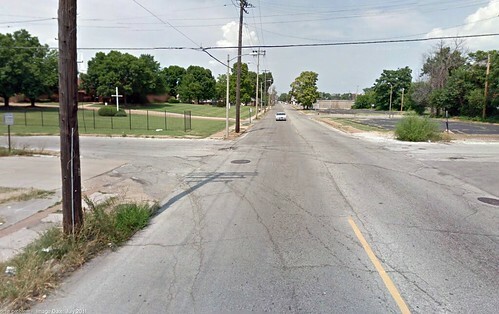 The stretch of Taylor Avenue between Delmar & Page is a stark wasteland of mostly vacant lots and surface parking lots. 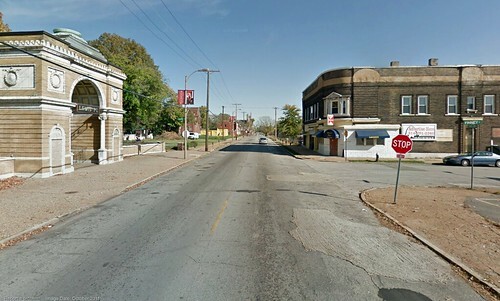 Compared to other nearby north-south streets and the east west residential streets, Taylor is especially desolate. Seven Twenty Five Liquor, a small drive-up store at Taylor & Enright is one of the few surviving businesses. At Taylor and the old Hodiamont streetcar right-of-way a suburban style church is set back behind a deep lawn on the large property that was once the location of Missouri Baptist Sanitarium, the precursor of today's Missouri Baptist Hospital. The intersection of Taylor and Lewis Place to the west & Finney to the east is one of the few bright spots along this stretch. Like a miniature Arc de Triomphe, the 1894 gate by Barnett, Haynes & Barnett stands guard at the east end of historic Lewis Place. 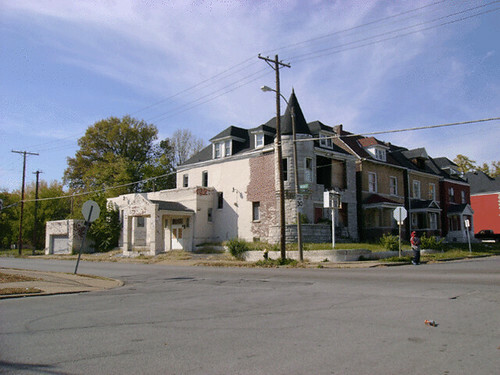 Across the street is an attractive small historic building that houses a neighborhood tavern but sits isolated as an island at the corner of a large surface parking lot of Ranken Technical College. While it seems to have lost its cornice the building, the building appears relatively well maintained. One block further north at the intersection of Taylor & Newberry Terrace was a lovely large stone residence with a corner turret. The home was later converted to a funeral home with a rear wing, entrance and circle drive off Taylor. Several years ago a small section of the front masonry wall between two second floor windows collapsed. As you can see, while creating a large opening, the collapse did not pose major structural issues for the rest of the building and was easily repairable. A bearing wall running down the middle of the second floor supported the third floor and roof structure. The building held the corner of a fairly solid block that is a mix of historic homes and recent infills, many built by Ranken students. The front wall was apparently not the first exterior masonry issue for the home. 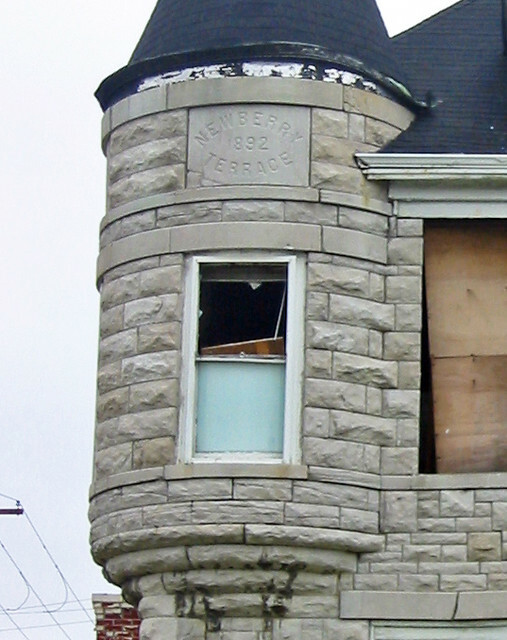 A building permit was applied for in October 2002 to repair an exterior masonry (presumably the area of unpainted brick just behind the turret) wall at the cost of $4,000.00. A few electrical permits were also applied for through June 2004. In 2007 ownership changed from private hands to the City's LRA. 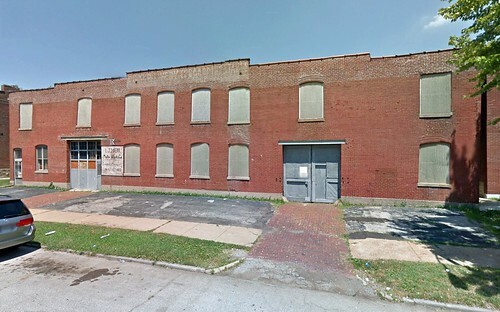 On 4.28.11 the owner became Ranken Technical College, and in June 2011, a demolition permit for the entire building was applied for with an estimated cost of $38,500.00. 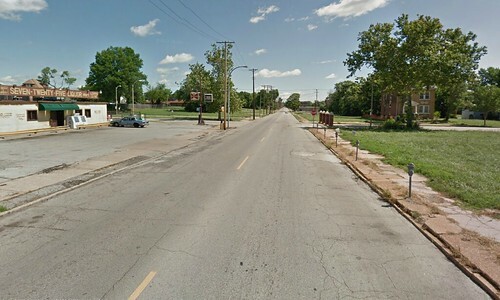 Today the corner is another vacant lot on this dreary stretch of Taylor.